We have a new addition to the “tastes-too-good-to-be-this-easy” pantheon of recipes in the SMEs household. 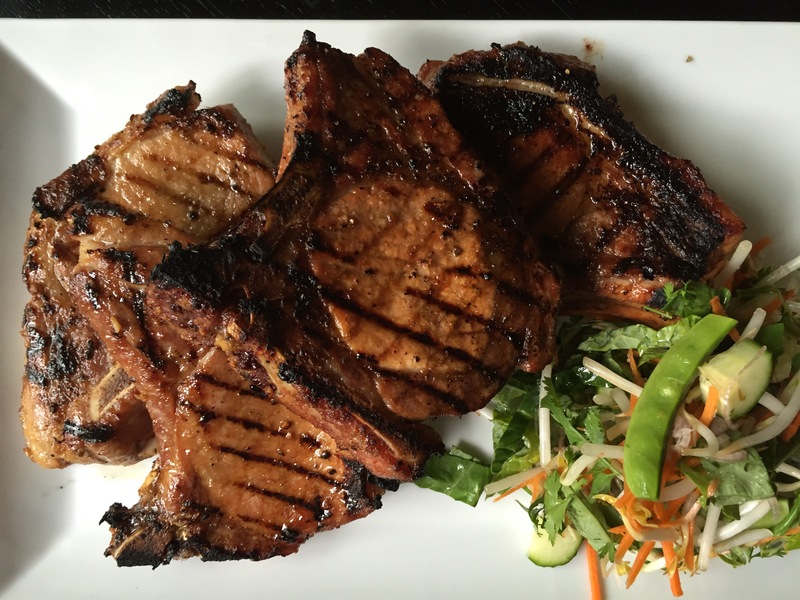 Behold, Vietnamese Pork Chops with Herb Salad. Anything involving fish sauce and a grill is going to go over pretty well with me, but I thought this a fun treatment for some thin-cut pork chops from Patchwork we had hanging around in the freezer. Whip up a simple marinade, toss the chops in and you’re a cool, quick salad and hot grill away from being done. The original recipe comes from Bon Appetit magazine, but when it comes to the salad, use whatever veggies you have on hand. I could easily see that last bit of red cabbage in the fridge, some chopped broccoli or cauliflower, maybe even some avocado showing up in this. If it plays well with vinegar and limes, it’s good to go. Note: The original recipe – creatively, I thought – worked firm red plums into the salad. Good idea, but I had plenty to work with in the fridge without buying more stuff. Do your own thing. Blend shallot, garlic, brown sugar, fish sauce, soy sauce, oil, and pepper in a blender. Transfer marinade to a large resealable plastic bag. Add pork chop and turn to coat. Seal bag, pressing out air; chill at least 1 hour or prep in the morning and let it marinate while you’re at work. Prepare a grill for medium-high heat. (Alternatively, heat a cast iron pan over medium-high.) Remove pork chops from marinade, letting excess drip back into bag; season both sides with salt. Grill pork chops, turning once, until lightly charred, about 2-3 minutes per side, depending on thickness. If you have a meat thermometer, shoot to pull the chops at about 140 degrees. Worried that won’t be done enough? Don’t be. Meanwhile, toss salad ingredients and vinegar in a large bowl. Season lightly with salt; toss again.